Know your risk. Take action. Be an example. In 2013, there were seven weather and climate disaster events with losses exceeding $1 billion each across the United States. These events included five severe weather and tornado events, a major flood event, and the western drought/heat wave. Overall, these events killed 109 people and had significant economic effects on the areas impacted. 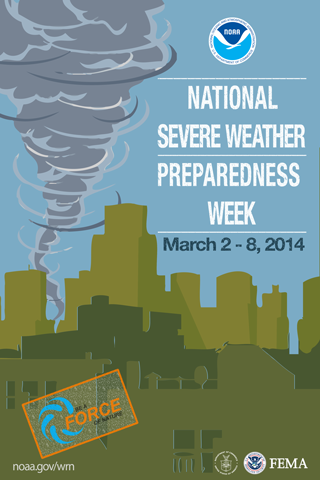 During National Severe Weather Preparedness Week, March 2-8, 2014, NOAA and FEMA will highlight the importance of preparing for severe weather before it strikes. Being prepared for severe weather doesn’t have to be complicated or expensive. A few simple steps, such as having a disaster supplies kit, could help save your life. During National Severe Weather Preparedness Week, we ask that you Be a Force of Nature by knowing your risk, taking action and being an example where you live. Whether you’re a blogger, reporter or social media superstar, you can help spread the word during National Severe Weather Preparedness Week. The materials listed below are free to use in print publications, online news stories and even Facebook. Help the National Weather Service and FEMA build a Weather-Ready Nation, one that is prepared for severe weather whenever and wherever it occurs. Presidential Message – When it comes to severe weather, we all have a role to play. NOAA/FEMA Press Release – During National Severe Weather Preparedness Week March 2 to 8, the National Oceanic and Atmospheric Administration (NOAA) and the Federal Emergency Management Agency (FEMA) are calling on individuals across the country to Be a Force of Nature: Take the Next Step. Poster – Grab the National Severe Weather Week poster. Be a Force of Nature Graphic – Download the Be a Force of Nature graphic for use in social media and blog posts. Facebook Cover Graphic – (no logos) – Change your Facebook cover with the National Severe Weather Preparedness Week poster. Tornado FAQ – How do tornadoes form? Where is the safest place to shelter? Should I open the windows in my house during a tornado? Get answers to frequently asked questions about tornadoes. Learn what to do before, during and after a tornado with these shareable YouTube videos from NOAA. Do you know how to protect yourself, family, pets and property from severe weather? Get practical advice from the National Weather Service on surviving a storm. Severe weather poses unique hazards for workers and employers. The Occupational Safety and Health Administration (OSHA) provides resources for workplace preparedness for and response to severe weather emergencies, including tornadoes. 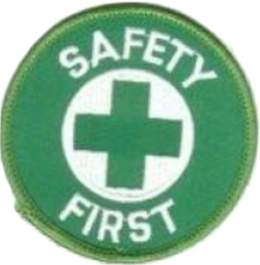 OSHA also provides information for workers involved in response and recovery operations for severe weather events. OSHA and NOAA encourage workers and employers to be aware of weather forecasts so that they can be better prepared. In addition to National Severe Weather Preparedness Week, many states have their own severe weather preparedness weeks. Check the Weather Awareness Events Calendar to find yours. We invite your questions. Email us at wrn.feedback@noaa.gov and follow us on Twitter@NWS.